Angry FC Zürich fans tried to storm their team's dressing room on Wednesday evening, after relegation was confirmed on the final day of the Swiss Super League season. Hibernian and Rangers fans clashed on the pitch after the match. 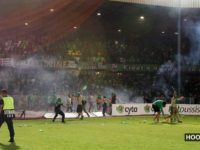 Fans from both clubs clashed with riot police and each other after the end of the Cyprus Cup final match. Fans of both teams clashed inside the St Jakob-Park stadium prior to kick-off. Eskişehirspor fans trashed their own stadium after the game against İstanbul Başakşehir. Fans of Clube de Regatas Brasil and bitter rivals Centro Sportivo Alagoano clashed violently after the final whistle.